Karate, ‘empty hand’ in Japanese, is a martial art where arms and legs are systematically used for defence and attack. 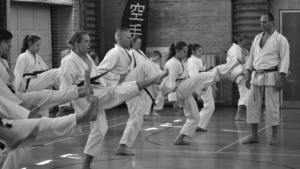 Karate builds strength and stamina, flexibility, coordination and power. It is very important for the body to move as a unit. This can only be achieved through persistent practice. Karate has also a mental aspect. The discipline of learning this martial art, the need for constant self-examination and self-improvement, and the challenge of the opponent build values of character and of inner strength. The student who trains regularly and with determination will develop body, mind and spirit. 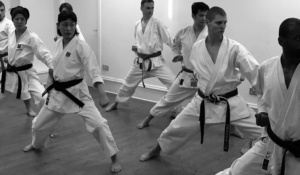 Practice is divided into Kata, Kihon and Kumite. All the techniques in Karate are well controlled. As students improve the strength of their blocks, kicks, and punches, they also learn how to target them more accurately. 一、人格完成に努むること Hitotsu. Jinkaku kansei ni tsutomeru koto. 一、誠の道を守ること Hitotsu. Makoto no michi o mamoru koto. 一、努力の精神を養ること Hitotsu. Doryoku no seishin o yashinau koto. 一、礼儀を重んずること Hitotsu. Reigi o omonjiru koto. 一、血気の勇を戒むること Hitotsu. Kekki no yù o imashimeru koto. Kata are formal exercises consisting of pre-determined defensive and offensive movements, which are performed in a sequence. One performs these alone against a series of imaginary attacks by several opponents. Kihon is the constant practice of the basic movements which, due to their variety and complexity, can be considered as a complete art form themselves. The karate student learns how to direct power at a target accurately and spontaneously. Training kihon transforms various parts of the body into weapons to be used freely and effectively. Kumite is the training method in which the techniques of karate are safely put into practice. Students train with a partner, and strive to develop strong, committed attacks and powerful defences.